: Pale yellow to Greenish yellow , Free Flowing Liquid Characteristic floral odor. Geranium Oil is derived from the stem and leaves of geranium plant via steam distillation technique. Known for its long lifespan, this shrub generally grows in the borders of cultivation land, any field or road. This 3 feet long shrub has pinnacle shaped leaves that have whitish pink flowers at their edge. 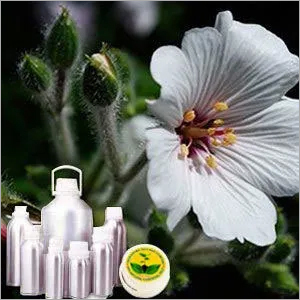 Geranium oil contains compounds like Citronellol (20 to 40%), Geraniol (7 to 20%), Guaiadiene-6, 9 (China), Menthone, 10-epi-eudesmol ( Algeria, Morocco and Egypt), geranyl formate and Linalool (5 to 15%). The middle note powerful smell of this essential oil resembles to the mild fragrance of rose oil. Geranium oil is also referred as rose geranium oil. Geranium essential oil is suitable to be mixed with other essential oils of Fennel, Citronella, Basil, Nutmeg, Lemon, Jasmine, Bergamot, Grapefruit, Lemongrass, Nerolia, Juniper, Clary Sage and Lavender. Known for its high medicinal value, Geranium Oil is used to treat breast engorgement, dermatitis, burns, tonsillitis, bruises, menopausal complications, edema, eczema, acne, ulcers and cuts.